The alert, hardworking Standard Schnauzer is a dapper fellow, with his whiskered chin and bold eyebrows. Standard Schnauzers originally worked as versatile farm dogs who could manage the rodent population, guard the land, and herd cattle. Today, their skills are harnessed for search and rescue, drug and bomb sniffing, and therapy work. The Standard Schnauzer's square frame is muscular and athletic, about midway between his cousins, the Giant and Miniature Schnauzers, in size. Standard Schnauzers are fast and agile, able to turn on a dime to herd an errant cow back to the herd. Schnauzers are playful, lively, and loyal with their families, but they are often standoffish with people and dogs they don't know. They need early socialization and committed training, so they don't become overprotective or aggressive. Abundant exercise and mental stimulation go a long way towards preventing most behavior issues in this energetic breed. The Standard Schnauzer is also known as Mittleschnauzer or, simply, Schnauzer. Coat - The Standard Schnauzer has a wiry double coat. The outer coat is thick and rough to the touch, and stands away from the body. The undercoat is soft and dense. The breed's prominent, wiry beard and eyebrows are among the Schnauzer's most distinguishing characteristics. The coat colors are a solid, pure black, or pepper and salt, which consists of banded black and white hair creating shades anywhere from dark gray to silver. The pepper and salt variety usually has a dark facial mask and light eyebrows, whiskers, and cheeks. Standard Schnauzers are sturdy dogs with muscular, square frames and big bones. Though they have an elegant air about them, they are never delicate. Their neck is strong and arched, and their head is distinctly rectangular. In motion, the Standard Schnauzer is lively, quick, and agile. Their high tails are docked when meeting the AKC standards. The breed is intelligent, alert, and playful. They can be guarded around strangers, but they are utterly loyal and loving with their families. Standard Schnauzers originated in the Bavarian region of Germany, possibly as far back as the 1300s. Their exact ancestry is unclear, but they are thought to have developed from crosses between the Wolfspitz and black German poodles. 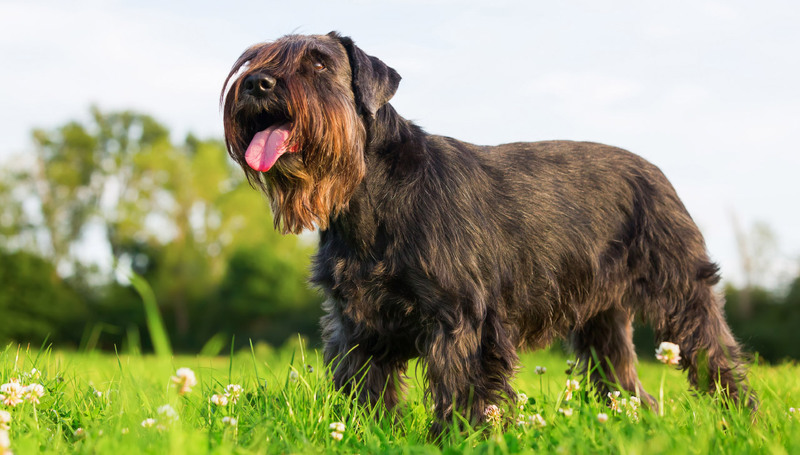 The breed was originally known as the Wirehaired Pinscher, but they were eventually called Schnauzers, which derives from the German word for 'snout' and is a reference to their distinctive whiskered muzzle. The versatile Standard Schnauzer worked as a ratter, herder, and watchdog on farms and in stockyards. The Giant and Miniature Schnauzer varieties are offshoots of the original Standard type. Schnauzers were enlisted in World War I to work as messenger dogs for the Red Cross and as German police dogs. After the war, they gained popularity as working, show, and companion dogs around the world. The American Kennel Club first recognized the breed in 1904 in the terrier group, but Standard Schnauzers were reclassified as a working breed in 1945. Standard Schnauzers are vivacious, playful, and loving with their families. They are sometimes aggressive or overprotective with strange dogs and people, especially if socialization was spotty in their youth. Schnauzers are intelligent and a bit stubborn, which can make housetraining and obedience training a long process requiring an abundance of patience and dog treats. The breed is highly alert to perceived dangers to their family and their property, and they'll bark vehemently when they sense something is amiss. Schnauzers become bored quickly, so they pair best with families who can keep them busy and active. Are Standard Schnauzers Good with Kids? Standard Schnauzers love the children of their pack, especially when they've known them from puppyhood. This is a boisterous and bossy breed, however. Teach older kids how to manage Schnauzers during walks and play sessions, and always supervise young children around the breed. Keep Standard Schnauzers in a separate room during playdates with kids they don't know because they can become protective of the children of their family when play gets boisterous. Are Standard Schnauzers Good with Other Pets? When socialized with them from an early age, Standard Schnauzers tolerate the dogs and cats who share their home. They can be aggressive with dogs they don't know. Leash training and socialization are imperative to maintain the peace during daily walks. With their strong prey drive, Schnauzers are not ideal housemates for small animals. Standard Schnauzers protect their people and their territory, and may become aggressive when they sense a threat. Are Standard Schnauzers Good Guard Dogs? Standard Schnauzers are watchful dogs who let their family (and the neighborhood) know when strangers and delivery people approach the house. Though not as intimidating as their Giant cousins, Standard Schnauzers can be ferocious guard dogs if they sense their families are in danger. Standard Schnauzers are spirited, energetic dogs who require hours of exercise every day, ideally as a mix of play sessions, long walks, running, and advanced training. Standard Schnauzers are bold and strong-willed. They may be aggressive towards people and dogs they don't know, especially without adequate socialization when they are young. They tend towards destructive behaviors when they get bored. Their coats require clipping or stripping, in addition to regular brushing. Indoor Standard Schnauzers are family dogs who should live indoors with their favorite humans. They are light shedders, so they won't leave excessive fur around your home. They are adaptable to apartment living as long as they have someone with them all day and they get outside often to exercise. Crate training Standard Schnauzers lets you leave them for an hour or two without returning to pillows and chair legs ruined by chewing. Outdoor Though the Standard Schnauzer's coat is weather resistant, the breed doesn't adapt well to outdoor living because they become bored and destructive when left to their own devices. That said, the breed should spend hours playing, running, and walking outside with family members. Because Schnauzers chase neighborhood squirrels and cats, secure your yard completely to prevent escape. Exercise A healthy Standard Schnauzer needs several hours of vigorous physical activity every day. Endurance Standard Schnauzers don't run out of steam easily. They'll be up for playing all day if you are. Running Miles: Standard Schnauzers will run with you for three to five miles. They make excellent exercise partners for running and biking over moderate distances. Hiking Miles: The well mannered Standard Schnauzer is good company on the trail and will manage a trek of five miles and more with ease. Food Generally, this breed requires about 1 to 2 cups of good quality dry dog food each day, over the course of two feedings. This will vary, however, based upon your Standard Schnauzer's activity level and age. Talk to your veterinarian about the optimal diet and quantity of food for your Schnauzer. Alone Time Standard Schnauzers are independent enough to spend a few hours alone, but be aware they become bored quickly and may turn to nuisance behaviors, such as barking and chewing to pass the time. Leaving your Schnauzer in a dog crate stocked with a puzzle dog toy minimizes problems. The Standard Schnauzer's wiry coat must be hand stripped every four months by you or a specialist groomer, or it may be clipped. Be aware that clipping your Schnauzer's coat will soften the texture and lighten the color. Standard Schnauzers need brushing a few days a week, while the long hair on their face and legs requires daily brushing to prevent knots. Wash your Schnauzer's ears weekly with a gentle, dog-friendly cleanser to prevent dirt buildup that can cause infections. Brush their teeth several times a week and trim their nails every month to prevent painful cracking. You can minimize serious health concerns in a Standard Schnauzer by purchasing from a reputable breeder who engages in responsible breeding practices, and through screening for common diseases and conditions. Standard Schnauzers are smart but they like to forge their own path, which can make training a challenge. House training and basic commands will come, but require firm, consistent, and gentle training with plenty of positive reinforcement and dog treats to reward achievements along the way. Smart and athletic, Standard Schnauzers benefit from continued training, including advanced obedience skills, agility training, and most dog sports. These activities keep your Standard Schnauzer healthy and prevent boredom, and the destructive behaviors that arise from restlessness. Standard Schnauzers are excellent herders and don't excel as hunting dogs. Yes. Standard Schnauzers are considered a hypoallergenic breed. Their wiry coats don't shed heavily and, as a result, pet dander is less abundant in your home. Regular grooming of your Standard Schnauzer can minimize pet dander even further. No dog is 100 percent hypoallergenic. No. Standard Schnauzers and Giant Schnauzers are both considered working dogs. Their miniature cousins are classified as terriers, however, which has caused some confusion. Miniature Schnauzers were bred specifically to hunt vermin, which is a common terrier trait. While Standard Schnauzers were ratters, they were also watchdogs and protectors of cattle on the way to market, which earned them their working dog status. Standard Schnauzers are able to swim, and some of them enjoy the pastime. Don't push your Standard Schnauzer to swim unless she wants to, and always watch her closely.